The women in your life have been by your side through it all and now it’s time to show them how much it means to you to have them by your side on the biggest day of your life. The Bridal Rail offers a large selection of beautiful and affordable bridesmaid dresses for every member of your bridal party. Choose from several bridesmaid dress collections. Remember, we do offer discounts on bridesmaid dresses when purchasing an entire bridal party. 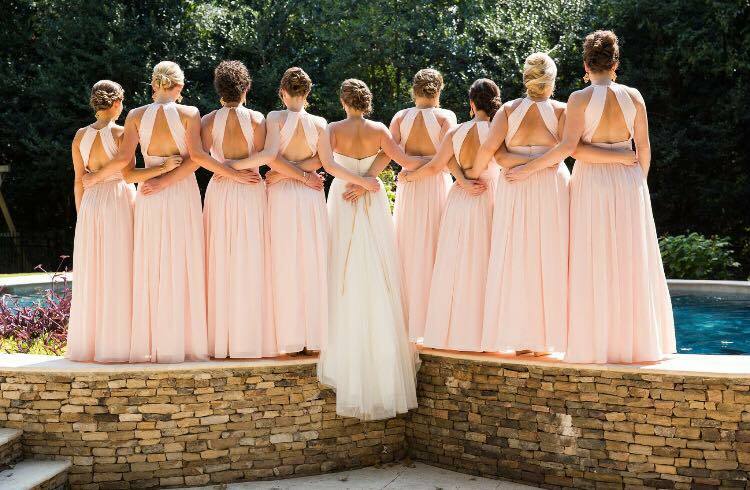 With 4 or more bridesmaids, receive a 10% discount off each gown. For your convenience, bridesmaids can print off the following “Bridesmaid Dress Order Form*” and complete the information needed, then fax or mail the form back to us. In addition, to assist bridesmaids in selecting the appropriate size, we provide a “Bridesmaid Dress Size Chart*” for sizing information. Remember, the dresses are junior cut and generally run small. You may need to go up a size for normal ease or fit. A 50% deposit is required from each bridesmaid before the gowns will be ordered.